This hyacinth plant was growing in the Museum Gardens in York and I found it as I was walking along the river bank when we were visiting recently. 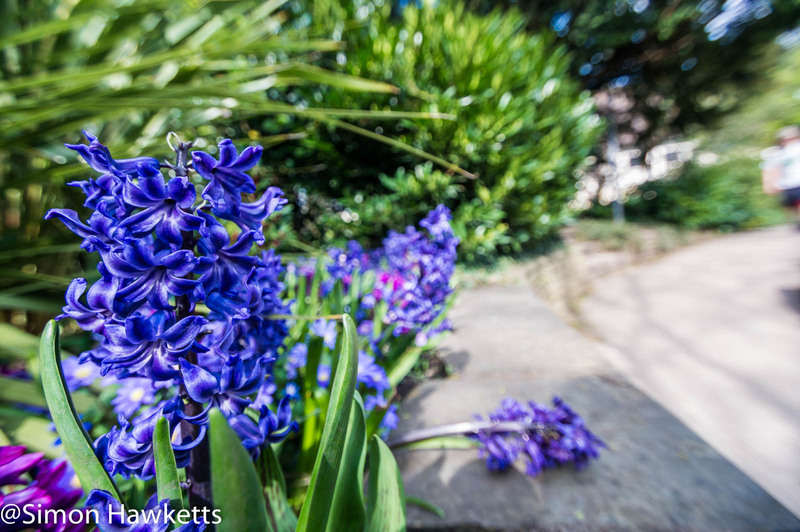 Since I had my wide angle Tamron lens fitted to my camera I tried taking a flower shot using the widest setting of 10mm with the aperture open as wide as it would go which is f/3.5. Obviously at that setting the background defocus will not be very great, but I think it’s just enough to let the main subject flower stand out. The background is still rather busy even at 3.5 and this close to the subject. Mind you, depth of field is always greater with wide angles. Yes that’s true. It was a bit of an experiment to see how blurred the background would be with such a wide angle lens.